The beautiful Villino Blu stands in a panoramic and quiet position on the slopes of Pratomagno in the heart of the Upper Arno Valley, surrounded by olive groves and vineyards, and offering a spectacular view of the valley. Nearby, the ancient Via dei Setteponti curls along a hilly and panoramic route dotted with many small towns rich with history, Roman churches, and medieval hamlets. 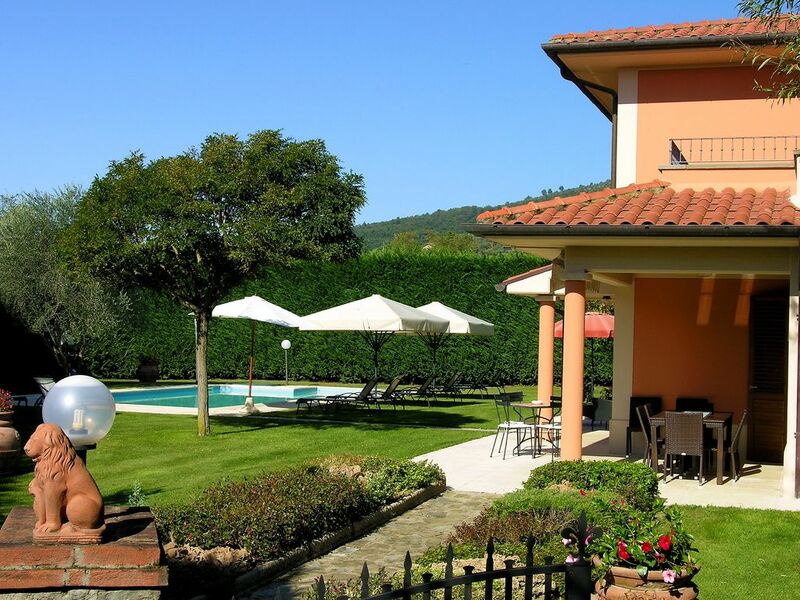 Its favorable position in the central area of Tuscany makes it easy to reach the principle Tuscan art cities like Florence (50 km), Siena (60 km), Arezzo (30 km) and Pisa (120 km), both by car and train, as the railway station is only 10 km from Villino Blu. About two kilometers away is the village of Loro Ciuffenna, where many characteristics of this ancient medieval hamlet have been preserved – like the PIEVE DI SAN PIETRO A GROPINA, an 8th century AD Roman parish church – and where visitors can find typical restaurants and shops, supermarkets, bars, banks and a pharmacy. The unpaved road leading to Villino Blu is reserved exclusively to guests and the entry to the villa is provided with an automatic gate. The villa is immersed in a charming garden of approximately 1,500 square meters that is enclosed by hedges, flowers and roses, and equipped with a barbecue, lounges, a 6 x 12 meter pool that is 1.40 meters deep with lateral steps. There are also three covered garages at guests’ disposal. "Cortesia e disponibilità del proprietario completano l'ottimo giudizio sulla casa." "Notre visite à la villa de monsieur Paolo va demeurer, pour nous, un souvenir impérissable. Les lieux sont d’une propreté et d’une élégance exemplaire. Rien ne nous a manqué, parfaitement équipée la maison est conçue pour que les espaces de vie soient multiples et invitants. Le vaste aménagement extérieur est parfaitement entretenu et la piscine impeccablement nickel. La localisation de la villa, tout près d’un joli village du Chianti, au cœur de la Toscane et à 60 kilomètre de Florence et d’Arezzo en font un endroit idéal pour visiter la région. Mais, par-dessus tout, c’est la chaleur et la gentillesse de la famille qui nous a tous séduit. On ne compte pas les attentions auxquelles nous avons eu droit. La discrétion dont tous les membres de la famille savent faire preuve est une autre illustration de l’hospitalité non envahissante de ces gens merveilleux. Paolo, a lei e alla vostra famiglia, mille grazie. "La maison est magnifique ainsi que le jardin et la piscine les photos sont fidèles a la réalité. les loueurs étaient charmants et attentionnés nous avons été gatés de fruits de légumes et d'oeufs frais.nous avons passé d'exellentes vacances, merci." Exit at ‘Valdarno’ of the Autosole A1 Milan-Rome Highway: COMING FROM EITHER MILAN OR BOLOGNA (e.g. FROM THE NORTH), TAKE THE SECOND EXIT AFTER ‘FIRENZE SUD’; COMING FROM ROME (e.g. FROM THE SOUTH), TAKE THE FIRST EXIT AFTER ‘AREZZO’. Turn right and follow the signs for Terranuova Bracciolini, then for Penna and after that for Loro Ciuffenna (about 8 km from ‘Valdarno’ exit). After having passed the village of Penna, you will find a long straight street (approx. 2 km), at the end of which is a roundabout. Turn right and enter into the village of Loro Ciuffenna: turn left in the direction of Castelfranco di Sopra and, after about 2 km, on the right you will find the sign to Villino Blu (turn right) after approximately 300 meters. The Pieve di San Pietro a Gropina is the most visited church in the province of Arezzo: a splendid Roman construction with very particular features, splendid capitals, and a unique pulpit that derives from the ancient ruins of a Longobard church lying beneath the pavement. Its simple sandstone ‘a flaretto’ (in thin layers) façade reflects the motif of the three naves inside. Inside the church, we find a pulpit that is considered the artistic treasure of the Pieve di S.Pietro a Gropina. The opportunity to admire this unique and particular ancient church, a masterpiece of 8th century AD architecture, where art becomes symbolism and mystery, makes the trip worthwhile. I must add that, during my visits to Tuscany, I have seen many pulpits, but never one like this one. Indeed, there are no others so ancient and peculiarly built with knotted columns. This type of column represents the great mystery of Faith and the Holy Trinity with its three equal but distinct beings: Father and Son are represented by two knotted columns, and the Holy Spirit is symbolized by the knot.